We all want to be accurate in our shooting. As close to the bulls eye as possible every time. Check out these tips to help you zero in your red dot and get you as accurate as possible on the range with your AR-15. 1.Set up the Aimpoint target at 25 meters. 2.Place firearm in solid rest and center dot on target. 3.Take one shot and inspect the point of impact. 4. With the information given on top of the printed Aimpoint shooting target, and by counting the number of squares between the actual point of impact and the desired point of impact on the target, you can quickly and precisely determine how many clicks you need to move the adjustment screws in order to zero your sight. NOTE: The number of clicks per square is determined by the distance to your target. 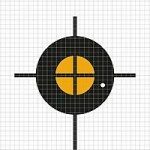 Question: What is a good entry level red dot scope if am just starting out? Check out the Bushnell Trophy TRS-25 Red Dot review by Kevin: First things first, let’s establish what the Bushnell TRS-25 is NOT – it is NOT an Eotech or Aimpoint red dot sight. It is also less than 20% of the cost of either of those sights. That being said, for the price, the Bushnell Trophy Red Dot TRS-25 3 MOA Red Dot Reticle Riflescope is an excellent sight. The construction is solid, it attached to the flat top rail of my AR15 easily and securely. The rubber lens covers, attached to each other by a small rubber cord, are sufficient for protecting the lenses from most objects and debris while remaining in place. Question: My red dot battery keeps going dead after only a few weeks. What am I doing wrong? You are probably leaving it on the 1 through 11 setting (increase of red dot). It needs to be set on 0 (zero) after you finish for day. If you leave it on 1 – it will slowly drain the battery. Question: How to adjust Bushnell trs-25? Check out the info and review in the video below. Question: What about the bushnell custom series reflex red-dot sight? The Bushnell Trophy Red Dot First Strike 5 MOA Red Dot Reticle Riflescope is getting good reviews and we have seen a few shooters out at the range using it. You can pick up one for under $120. Question: Do you have any tips on sighting in a Deltapoint pro from Leupold? Answer: We are currently working on a review for that scope and will post up a link when finished. I recently bought a POF rifle and a EOTech sight. The rifle does not have a front sight. Do I need one and where would I go to get a proper front sight? Yes, my opinion is always have back up iron sights. I use an EOTech 512 with Diamond Head irons. If your AR has the top rail, indeed add a iron rear and hopefully you have gas impingement front sight assembly. If not, I’d add a front sight as far forward on the rails as possible. Iron sights for me too! I always use AR platforms for zeroing the red dot and use lollipopping (absolute co-witness) as a method. 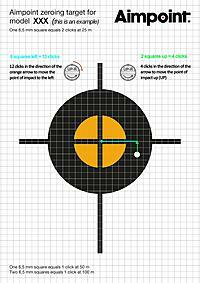 Though i prefer zeroing at 50 yards as it also gets zeroed for 200 yards. Not sure what type of red dot you have, but if it’s any thing but a Vortex/Aimpoint/Sig Romeo/Trijicon, we’d suggest getting a new sight. Products made by NCStar or Monstrum will not last long. Buy one, cry once, right. That being said, I’d buy a laser boresight, and calibrate your red dot that way. Set it up, making sure it’s clear of course, and point it at the wall with the boresight in the chamber/barrel. Then adjust the red dot until the red dot on your sight overlaps the laser. Hope this helps. Not sure what type of red dot you have, but if it’s any thing but a Vortex/Aimpoint/Sig Romeo/Trijicon, we’d suggest getting a new sight. Products made by NCStar or Monstrum will not last long. Buy once, cry once, right. That being said, I’d buy a laser boresight, and calibrate your red dot that way. Set it up, making sure it’s clear of course, and point it at the wall with the boresight in the chamber/barrel. Then adjust the red dot until the red dot on your sight overlaps the laser. Hope this helps.